When Anne Legare emailed me with a recommendation for No More Jellyfish, Chickens Or Wimps: Raising Secure, Assertive Kids in a Tough World by Paul Coughlin, I have to admit, the title caught my attention. I asked her what it was about. Your children don't need to be timid and anxious. You can protect them without paralyzing their growth. You can be a father who doesn't falter or a mother who doesn't smother. I asked Anne if she used the book with her children. The story she told me was both sad and encouraging at the same time. 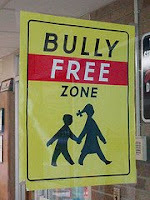 Our kids are in public school, and have been bullied. Years ago, when our 26-year-old daughter was bullied, we told her to go back and stand toe-to-toe with the girl and tell her to back off. She did and the girl did. Two years ago, our 13-year-old had his finger broken by a bully. We went to the principal and asked for a meeting with the boy and the mom. We didn't roll over, but we didn't over- protect. We wanted the bully to feel a consequence for his bad behavior, but we wanted to show him grace as well. Anne continued, The premise of the book is that Christians are equating "good" to "nice. "We can't always be nice if we want our rights as Christians. I will stand up to people with foul language, music or media. My kids will too. The book has helped me in this regard. It's an easy read, with a lasting punch. Following Christ requires us to have a spirit of meekness, not a character of weakness. The words “do not be afraid” are throughout the gospels. Paul said in 2 Timothy 1:7 For God did not give us a spirit of timidity, but a spirit of power, of love and of self-discipline. No More Jellyfish, Chickens Or Wimps is available through Amazon. If your child is experiencing harassment or bullying but you want to help him or her deal with it following biblical principles, this book may just be the answer you’re looking for. How do you teach your children to handle conflict? Leave a comment. Oh Deb, I may have to get this book. We are right smack dab in the middle of all this. Our kids go to public school also and my oldest is in jr. hi. Well the language is deplorable at her school. We thankfully have a Christian principal and I spoke to him about what our daughter is hearing at school. He didn't realize it was as bad as I told him. Of course the students don't swear around him. He talked to Paige and really encouraged her to hang in there. Also, Paige overheard her P.E. coach use a bad word this week while speaking with other teachers. She confronted him and he apologized and said he didn't realize she was close by. I'm proud of her for saying something to him. Hopefully even he will be convicted about his language from now on. Thanks for letting me know about this. My daughter has been so upset for weeks. She wore a McCain Palin pin to school and was called racist by several kids. Since then the language has really gotten to her. She's breaking out in hives at night. It finally all came out last week what was going on at school. I've been praying God would reveal to me why she's getting the hives. I knew it was anxiety and not environmental. I'll check into getting this book. I'm so sorry your daughter is going through this right now. As an introverted, bookish teenager, I was harrassed by several girls, and one time punched into some lockers by the high school bully - just because. It's a difficult time as it is with discovering your identity and purpose in life on your way to becoming an adult, made even more difficult when you're a Christian and know that you have a certain way you want to behave to please the Lord. I hope the book is a help. I'll let Anne Legare know that her recommendation was a blessing to someone. our kids are like lights in a dark world and i pray that light grows in others around them but i too agree that there needs to be firm boundaries for bad behaviour..kids need it.